OK, easy call, I know. This is the course where Annika Sörenstam decided to take up golf as a junior. The rest, as they say is history. Sörenstam is arguably the best woman golfer ever, but is without argument the most successful professional golfer that Sweden has ever produced. But the reason for the inclusion of Bro-Balsta is not the course’s famous protégé. Famed Swedish course designer, Peter Nordwall, designed Bro-Balsta. Nordwall’s principle in designing with environmental concerns is showcased as Bro-Balsta is naturally placed in beautiful surroundings. Another characteristic of the 18-hole course are the large undulating greens. Based on the greens found on the famous links in Scotland, their size allows less maintenanceto hold their quality, as well as leading to putts that are as long and twisting as the roller coaster at your local amusement park. Annika Sörenstam birdied the final hole to win the 2006 Scandinavian TPC title by a stroke from Mexico’s Lorena Ochoa at Bro-Balsta Golf Club, her home course where she had played since age 12. Sörenstam closed out her defense with a flawless eight-under-par 65, to equal the course record. It would be the last time she would win as a professional in Sweden. Sweden is one of the best countries to play golf. The season, generally, runs between May and October. Sweden has many excellent golfing venues, some of them are world class golf courses by architects like Robert Trent Jones II, Jack Nicklaus and Kyle Phillips and native Swedish designers like Nordwell, Nordstrom, Linne and Chamberlain. Swedish golf courses are a treat for golfers. Swedish golf courses will not only give you a challenging game, they also represent the countryside in which they reside as if Nature shaped the golf course through eons of ice, wind and snow and the human designers decided where to grow the grass for the greens and tees. Swedish golf courses not only give you a good game but many, many are scenic walks as well. A number border on environmental and wildlife reserves. • Number of golf courses: Of the 31,000 golf courses around the globe, 450 are located in Sweden. • The population of Sweden is about 9.4 million people. • Number of Swedish golfers: about 491,401 registered golfers. • Of all Swedes who play golf, about a third are women. • 20 percent of Swedish golfers are at or under the age of 20. • Around six percent of all Swedes play golf, the highest percentage in Europe. According to a survey done by the Swedish Golf Federation in 2010, exercise and health was reported by no less than 76.3 percent of all Swedish golfers when asked why they play golf. Socializing with family and friends got a 67.6 percent response. Noteworthy was that only 27 percent of the survey participants mentioned the competitive element, thus emphasizing that golf is a very social sport in Sweden. Swedish golfers take their game very seriously, however. Most Swedish golfers walk their course, pulling a buggy and they don’t dawdle. Golf carts are becoming more available and are treated as motor vehicles by the Swedish government. Any member of a recognized golf organization can play at any course in Sweden although there may be local handicap restrictions. A golfer needs to be of a certain playing skill, usually acknowledged to be a handicap of no higher than 36. Don’t be surprised if you are paired with Swedish golfers when they ask what is your handicap or how many points you scored for your last round. Swedes play Stableford Golf with full handicaps. ( 1 point for a bogey, 2 for a par, 3 for a birdie, 4 for an eagle and 5 if you bag an albatross. Lycka Till (good luck) with that. Anything worse than a bogey, pick up to keep the group moving. You can book golf tee times through your travel agent, the hotel you are staying at or directly to the golf course you wish to play. When you go online directly to the club, you need to ignore the booking service labeled something like “LOGGA IN TILL MIN GOLF.” That is a service for Swedish registered golfers. You need to go directly to desk or send an e-mail to the course VD (General Manager). Members of recognized golf organizations can usually play at any course in Sweden although there may be local handicap restrictions. A golfer needs to be of a certain playing skill, usually acknowledged to be a handicap of no higher than 36. 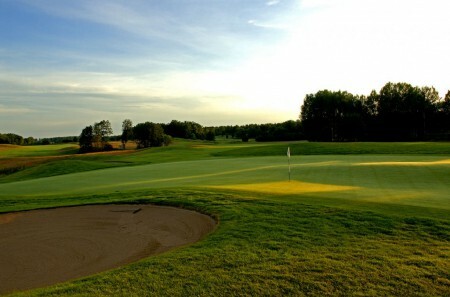 Öppen Golf, or Open Golf is the Swedish system of golf created in 1983. The intention of the system is to make Swedish golfers more competitive in international tournament play. Previously, Sweden used the same system as elsewhere where amateurs played in amateur tournaments and professionals in professional tournaments, and rarely in the same event. the consensus in Sweden is that way was not the best way for Swedes to improve. Why not let the best players meet in the same tournament in order to sharpen the competitive edge among the best. Open golf was implemented by the Swedish Golf Federation and the Swedish PGA in the winter of 1983. Starting the following summer, all Swedish golf events were declared open to all, provided that handicap requirements were met. Needless to say, amateurs still cannot accept prizes above the limits of amateur status. However, the issue is not monetary gain but the level of competition. There is no question this decision has played an important part in the success of Swedish golf in the competitive world of international golf. However, in countries that look at golf as a recreation first and a competitive sport second, the thoughts of the SGF, who say they wonder no other country has followed this easy step to encourage higher playing standards, may be a topic of debate. Don’t be surprised if you are asked what your handicap is or what you scored on your last round in bogey golf (with HDC, you score three for birdie, two for par, one for bogey, 0 for double bogey or higher). They are direct results of Open Golf . Take some time to make sure that you know what to expect from Sweden when it comes to the weather. A little bit of foreknowledge can help you in what you need to pack and what you need to be ready for. In the first place, you will find that Sweden manages to enjoy a fairly temperate climate for many months out of the year, thanks to its proximity to the Gulf Stream. In the northern, mountainous areas of Sweden there is a more Arctic atmosphere and for about six weeks you can enjoy the Midnight Sun in the far North. Though I mentioned Arctic, most days are still warm enough for shirt sleeves, but always have a jacket or sweater. While you will not see the midnight sun phenomenon in southern Sweden during the summer, the days are quite long, with dark that lasting around five or six hours. In the south of Sweden the summer can last upwards to four months. Remember that you will deal with rain, even during the summer months. You should bring along a set of warm clothes. The weather can change with unexpected rapidity, and it is always in your best interests to be prepared. Consider what your personal needs are and how much time you are going to be spending outdoors. Make sure that you prepare for your trip if you include large cities like Stockholm. The city is a very popular tourist’s destination and the best hotel options will go fast. On the other hand, also remember that you can book your hotel room and secure it with no effective delay when you go online. Make sure that when you come to visit this beautiful city and the rest of Sweden that you are going to have a great place to stay. If you pick Sweden as your next golfing destination I know you won’t be disappointed. Find out why a small country like Sweden has produced some of the best golfers, male and female, to ever play on the world stage of golf. Between golf rounds you will experience the history and culture of a country who helped to shape the world. Sweden has everything to satisfy golfers and non-golfers alike. and singular signature. This unique perspective and his love for the game of golf led Peter to conceiving “Golf is Art”. of his images hang on the walls of some of the most prestigious public buildings and private homes. In 2007, a collection of Sweden’s most scenic golf courses called “The Swedish Golf Experience” was published. The book, with text in English by Gene Oberto, highlights the natural beauty of the Swedish countryside as only Peter can. Peter Corden lives in Stockholm with his wife and twin daughters. Thirteen can be a lucky number!